Since I spend so much time coloring my Zombie Wagon cartoons all retro style, I decided to make a functional charging station for my iPhone 4S using a new 64 box of certified Crayola Crayons. I modified the top left crayon sleeve with a piece of sturdy cardboard at the base to lock in the dock. I used a few layers of electrical tape to hold the connector in place then cut a fresh hole in the rear for my cable to exit rather than destroying the essential on-board crayon sharpener. After I snapped a close-up photo of the crayons, I used the image as a replica on my iPhone. I'm able to view incoming banner text messages with my phone left in place. 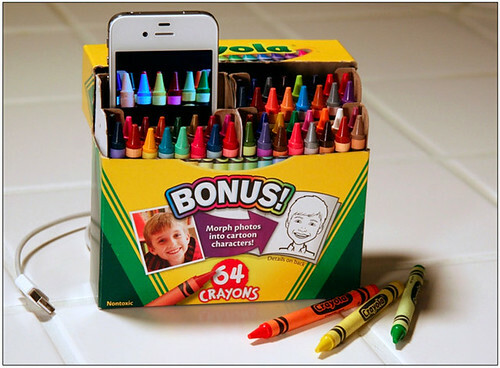 Just give the crayon box a firm squeeze and lift the handset to remove and close the lid. This simple do-it-yourself charging station can be completed in about an hour. I'm convinced that Crayola is going to nick my elementary school cool idea and rush this Crayon Box Dock into mass production. Somebody has to! Don't let the size of this wildly clever portable speaker fool you, it delivers up to 80 decibels of sound capable of filling up a large apartment living space. Say hello to your iPhone's new best buddy. The beautiful brilliance behind HiddenRadio is its intuitive design created by John Van Den Nieuwenhuizen and Vitor Santa Maria over a four year stretch. The speaker connects wirelessly to your iPhone, iPad or computer via Bluetooth, then just twist and lift the cap to raise the volume. It can also be used as a slick little conference speaker when you're not annoying your neighbors with an endless stream of Lady Gaga music or use the built-in AM/FM radio on board. HiddenRadio also comes equipped with a 3.5mm audio input plug that lets you to plug-in any device without Bluetooth. Using the companion iPhone app allows you to seamlessly switch playback on multiple speakers throughout the house. The designers promise over 30 hours of streaming music via the rechargeable batteries. This Kickstarter project touts the kind of inspiring ingenuity that makes buying into the product launch feel like a rare honor. Backers who pledge $119 will be one of the first to get a HiddenRadio device in metallic silver along with global shipping included. The offer would retail for over $175 which makes it a no-brainer to support. Delivery is expected in March 2012. Is This Big Red Button The Next Leap Forward In iPhoneography? After months of production, Beep Industries has begun shipping POPA, their big red shutter button designed for your iPhone camera. The unique device neatly attaches through the 30-pin dock connector on iPhone 4 and 4S which triggers the specially designed POPA camera app to open automatically. According to POPA designer Brendan Dawes, his creation was meant to transform the iPhone into a modern snapshot camera by bringing back the feel and speed of an old school shutter button. "The design is firmly rooted in the now but with a subtle, respectful nod to the beautiful and iconic cameras of the past," said Dawes. "We love buttons – we think they’re playful and inviting – they scream out “C’mon press me”. POPA began as a crowd funded venture on Kickstarter.com in June 2011, back when the device was still called Red Pop. Over 600 backers pushed funding for the project to $48,081 which more than doubled the $20,000 goal. In order to avoid a legal squabble with an over-sensitive soda brand, Dawes chose to change his Red Pop brand name to POPA before it launched. It became obvious early on that POPA was something that resonated with iPhone users anxious to add Beep's "big red button" to their iPhone photography. As first shipments have now begun to arrive, the chatter on Twitter has been loud and clear that this $75 iPhone option is a certified hit with early adopters. The development team at Tether.com, have confirmed that their wildly popular iTether iPhone app that existed in the iTunes App Store for less than a day was yanked down by Apple at approximately 12PM EST on Tuesday. The app was designed to share iPhone's data plan with your laptop to gain internet connectivity anywhere there's cellular coverage without having to pay the unreasonable tethering fees imposed by carriers. "Around 12PM EST, Apple called our head office to let us know they were going to go ahead and pull our app iTether from the App Store. They stated it was because the app itself burdens the carrier network, however they offered us no way to remedy the solution… We were very clear when listing the app what the primary function was and they even followed up with several questions and requested a video demo then they approved the application." wrote the iTether team in an official statement. "We strongly disagree that it burdens a carrier’s network, as from our own data history on more than 500,000 users we know the average user consumes less than 200 MBs of data per month on Tether. In comparison, one TV show streamed from Netflix, an approved Apple App, could easily be in the 300-400 MBs range. Sure, there are some users that will consume way more than the average however that’s the case with any of these types of products." It was speculated early on by many tech blogs that the app would more than likely be pulled down by Apple even though the company approved the app for launch. The iTether team insist that users who already plunked down $14.99 for the app before it was pulled will be able to use the product as promised. "According to Apple, users who purchase iTether before it was pulled will continue to be able to use the product." iTether said in their statement. Although Apple has indicated the product would still perform for early adopters who bought in before the bitter end, I'm cautiously optimistic the company will actually stand behind their promise. Let's give it a few weeks and we all shall see. "Our team is evaluating all of our options… Stay tuned." Having several iPhone ornaments dangling from the branches on my Christmas has become an annual family tradition around my house. This year we'll all be fighting over who gets to hang the shiny new iPad 2 devices we purchase. Each hand-cut iPhone 4 ornament measures (3" x 1.5") and comes in a small gift box complete with a hook for hanging. These ornaments are all cleverly equipped with magnets on back so you can slap them right onto your refrigerator to cherish all year long. Choose the Black or White model for either iDevice. Expect to pay $11 for the second coolest novelty gift idea this holiday season, the mini MacBook Air make-up mirror is definitely number one. Instant feelings of comfort and joy come free upon delivery. An new app that provides free USB tethering between your iPhone and laptop has landed in the iTunes App Store. iTether which will cost you a hefty $14.99, has slipped through Apple's approval process and caused a virtual feeding frenzy. The app is already highly rated by multiple early adopters. iTether lets you to share your phone's data plan with your laptop to gain internet connectivity anywhere there's cellular coverage without having to pay for those (unreasonably high) tethering fees imposed by carriers. AT&T charges its customers $45 per month for 4GB of data per month for and data tethering privileges. Apple has typically not allowed such applications to become available on the App Store due to carrier agreements, until now that is. The app works by connecting your iPhone via USB to your laptop and then it pairs with the Tether software that must be downloaded and installed onto your Mac or PC. The bad news is that connection to the Tether.com website is spotty due to the massive traffic spike, making the necessary software download impossible for many. The links above were provided as an alternate path for downloading and that option worked immediately. "Our team is battling all of the traffic... We've added 20 web servers to handle the load. Will keep everyone posted." Tether posted on their Twitter stream. Be sure to launch the iTether iPhone app to initiate tethering with your laptop. The app performed with my MacBook Air as promised which makes this one a must-have. Even though the app's developers claim they went through all the hoops to directly answer all of Apple's questions, I would definitely grab this app now before cellular carriers make a push to get it removed from the App Store. I'm certain it won't be hanging around for long. UPDATE 9:02 AM: iTether cannot be accessed through the App Store. It appears it has already been removed by Apple. More on this story. The idea of docking my ultra-modern iPhone on top of a vintage reel to reel tape is the perfect mashup of modern meets retro music geek. Even though I've seen plenty of do-it-yourself dock concepts including the memorable Dinosaur Dock, this original idea puts a fresh new spin on the genre. Designer GeekUnique, rescued and re-purposed a Telefunken 5 3/4" tape just for such an occasion as this. You'll pay $25 for the kind of iPhone dock certain to inspire epic stories about the glory days of rock. Uncontrollable vivid flashbacks come free upon delivery. Glif creators Tom Gerhardt and Dan Provost, originally funded their tripod mount through Kickstarter.com, with a goal of raising $10,000 for production and ended up pulling in over $137,000 dollars. Need I say more? The Glif+ iPhoneography package is priced at $30 for all three items, the add-ons alone are $12 if you already own a Glif. This little compact tripod mount is the only one your iPhone will ever need. Ever. What could be more satisfying for the hipster appetite than a classic all-American TV dinner? This fantastical pairing of iPhone with a 1950's retro heat-and-eat Thanksgiving feast is a dream come true. This latest food case by pop art designer Coolbeans717 goes way beyond her traditional Sushi Bento Box inspiration. I'm convinced her vinyl iPhone slip covers will be studied as enduring works of functional art by future generations at every intergalactic art academy in the universe. Give thanks by forking over $20 for the kind of turkey dinner you truly deserve, served up at room temperature for any iPhone you own. This is not just another disposable iPhone accessory... it's a steaming pile of art! A new contender in the Steve Jobs figurine battle has emerged from Budapest, Hungary with a one of a kind piece being called "the most Steve Jobs-ish Steve Jobs figure". The likeness of Jobs from head-on in this 10" tall figurine is quite remarkable. Seller iBeatninjas, is calling this completely unique piece "ultra rare" since there is only one. It's listed at a starting bid of $1,500 and comes complete with a MacBook Air in hand along with a red Angry Bird that can be changed out at will. A distinctive iPhone bulge can be spotted inside the front pocket of Jobs' classic Levi's 501 jeans. He's posed standing atop a white Apple logo with the phrase "One more thing..." embossed around the bottom. A limited number of Steve Jobs figurines originally sold for $80 by M.I.C. Gadget, were pulled from Ebay last year when some individuals attempted to re-sell them for a hefty profit. Apple claimed the figures violated a celebrity's right of publicity. Ebay immediately removed the items. "Look at the pictures, he is completely HIM," seller iBeatninjas wrote about his work of art. "Everybody have a “ninja” Steve, but only you will have THE Steve Jobs figure." So how much would you pay for a little Steve Jobs in your life? You may need to decide quickly before Apple gets wind of this "most Steve Jobs-ish Steve Jobs figure" first.